CONGRATULATIONS to all the recipients of awards at Glenora District School's presentation assembly yesterday and the donors who made them possible. Awards were presented to students in the primary and secondary sections of the school. Grade 10 student Lara Plunkett received 10 awards including Dux of the School. Central Highlands Council Further Education Bursary: Nicole Walker. Bushy Park Estates Bursary: Jesse Anderson. Norske Skog Bursary to Higher Education: Lilli Hayton, Isabella Jacklin, Connor King and Ebony Downie. Derwent Valley Council Bursary: Amelia Triffitt. New Norfolk High School Transition Bursary: Dallas Anderson. Sylvia & Charles Viertel Springboard to Higher Education Bursary: Lara Plunkett. Award for Art (Secondary): Lara Plunkett. Award for Multi-Media: Jesse Anderson. Award for Encouragement of Lifelong Learning in Numeracy: Tasha Kaye. Award for Materials, Design and Technology: Linus Castro. Award for Automotive Engineering: Dylan Walker. Award for Encouragement of Lifelong Learning in Literacy: Ruby Hay. Award for Science: Lara Plunkett. Award for History: Lara Plunkett. Award for Health and Wellbeing: Amelia Triffett. Award for the Arts (Primary): Madeleine Wright. Award for Primary Numeracy: Liam King. Award for Primary Literacy: Stephanie Laycock. Award for Outstanding Improvement to Reading: Dylan Russell. Award for Commitment and Focus to Home Reading: Aydan Bailey. Trevor McHugh Leadership and Service Award: Hayden Plunkett. New Norfolk Lions Club Citizenship & Service Award: Charlie Smith. Mark Shelton MHA School Spirit Award: Sharnie Triffett and James Conley. Rene Hidding MHA Initiative & Effort Award: Darcy Lovell. Senator Carol Brown Award for Special Contribution to the School: Harry Townsend. Shepherd Family Award for Service to the Community: Chloe Barrington, Lillie Skinner, Montanna Gittus. Guy Barnett MHA Volunteering Spirit Award: Dylan Davis. Senator Eric Abetz All Round Consistency and Effort Award: Stephanie Laycock. Shellie Triffett Award for School Values: Jayson Laycock. Brian Mitchell MHR Award for Engagement and Participation in School: Hayden Plunkett. David Llewellyn MHA Encouragement in Reading Award: Kayley Thorne. Bushy Park Show Society Award for Hospitality: Angel Morris. Derwent Valley Masonic Lodge Award for Transition from Primary to Secondary: Milla Hunt. Central Highlands Council Mayor's Citizenship Award: Almar JR Castro. Steven Cashion Memorial (Secondary Outstanding Sportsperson): Hayden Davis. SRC Outstanding Primary Sportsperson Award: Lucy Triffett. Sporting Participation Award (Primary): Ruby Jackson and Madeleine Wright. Effort and Endeavour Awards (Primary): Bailey Hall, Leah Laycock, Rylee Triffett, Abbey Davidson, Kayla Roach, Taylah Nichols, Abbey Bailey and Evie Anning. Citizenship and Service Awards (Primary): Ruby Lovell, Natasha Panschow, Jack Embrey, Lillie Skinner, Heidi Davidson, Mollie Fenton. Award for Special Efforts in Senior Primary: Damen Hall. Special Merit Awards (Secondary): Harry Townsend, Breanna Hansch, Dylan Walker, Lilli Hayton. Caltex All-Round Achievement Award: Lara Plunkett. Rebecca White MHA Glenora Merit Award: Callie Cooper. Craig Farrell MLC Participation Award (Secondary): Cain Plunkett. Craig Farrell MLC Primary Co-operation Award: Lane Scherer. Pursuit of Learning Awards: Hayley Hean (Primary) and Brock Hill (Secondary). Minister for Education's Respectful Schools Award: Isabella Cooper. New Norfolk High School Respectful Schools Award: Indianna Hill and Mia Temple. Primary Academic Excellence Awards: Crystal Plunkett, Ryan Jones, Hayden Plunkett, Indianna Hill, Callie Cooper, Stephanie Laycock, Tasha Kay and Isabella Cooper. Secondary Academic Excellence Awards: Brandon Plunkett, Mia Temple, Seb Hay and Lara Plunkett. Councillor Damian Bester Awards for Outstanding Achievement in Literacy: Emily Bester (Primary) and Seb Hay (Secondary). Claremont College Award: Lara Plunkett. ADF Long Tan Leadership and Teamwork Award: Lara Plunkett. Veart Memorial Award for Excellence - Dux of the School (donated by Student Representative Council and Councillor Damian Bester): Lara Plunkett. Dallas Anderson, Jesse Anderson, Jye Cooper, Ebony Downie, Georgia Hall, Lilli Hayton, Isabella Jacklin, Connor King, Harley Manie, Emma Mayne, Kylee McKay, Angel Morris, Brodie Percy, Lara Plunkett, Jack Smith, Kyle Strong, Amelia Triffitt, Nicole Walker, Mitchell White. 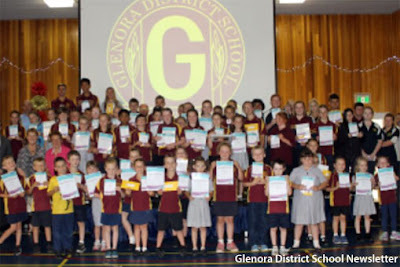 Award recipients at Glenora District School.